Marrakesh is a city of culture. It has a lively atmosphere, delicious cuisine, and impressive sights. It is a beautiful city that attracts all types of travelers. Many visitors prefer to stay in a traditional Moroccan riad during their visit. This Moroccan style of architecture is common in houses, palaces, and more recently hotels. It involves a central courtyard that often has a garden and fountain to complete the atmosphere. The natural light and social setting make a visit to a riad a unique experience that is not to be missed. 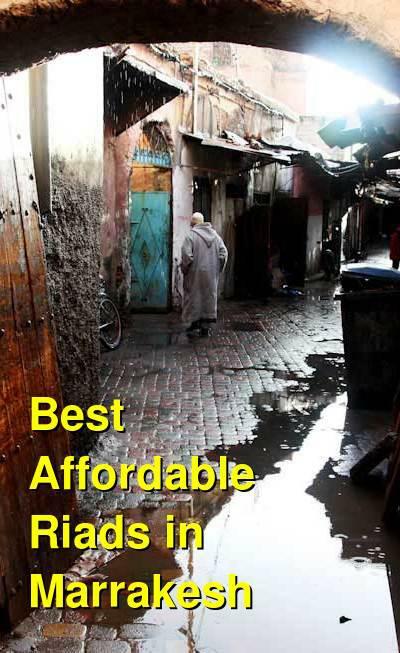 How much do hostels in Marrakech cost? This beautiful and ultra-colorful riad is a favorite hostel and guesthouse for travelers to Marrakesh. The staff are friendly and welcoming and the architecture is unique and beautiful. The setting provides a relaxed environment where visitors can retreat from the chaos of sightseeing. The riad is accessible but still set back on a quiet street. It's located in the medina of the old city walls and is just a short ten minute walk from many of the main attractions around town. This is the perfect place to stay if you're hoping to fully immerse yourself in the culture and lifestyle that Marrakesh has to offer. With free coffee and an open courtyard where meals are served, this hostel has a very open and social atmosphere. Their self-proclaimed "campaign against grey" shows around the building with their colorful decor. With free breakfast, free WiFi, hot showers, and laundry facilities, this hostel has a lot of great features! Located just a minute from the city's main square, this beautiful riad has a wonderful courtyard with a fountain, a variety of room types including dorms for those on a budget, and a social atmosphere where guests can linger and get to know each other. There's a dining room, roof terraces, and wi-fi access throughout the hostel. Although this riad is designed as a hostel, it still offers the comforts of an upscale facility at a price that backpackers can afford. It's perfect for budget travelers who want to experience what a true riad is like without the costs that are typically associated with it. It's truly an experience that no traveler should pass up. Located just eight minutes from the main Square of Djemma El Fna, this riad is the perfect place for visitors who are looking to escape the adrenaline of Marrakesh. It's a peaceful setting that is welcoming and comfortable. The guesthouse is charming and beautiful and the staff ensures that your stay is enjoyable. The family atmosphere of the hotel truly makes for a personal and unique experience. The hotel has a family friendly atmosphere more so than a hostel vibe, but it's wonderful setting, good price, and friendly atmosphere make it perfect for any type of traveler. 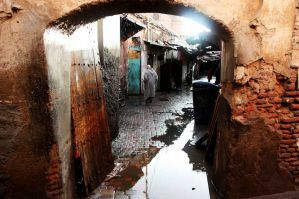 Riad Jomana actually has two guesthouses that are just 50 meters apart. There are rooms that are a variety of sizes ranging from private double rooms to private triple, or even quadruple rooms. The staff at the riad are warm and welcoming. You'll have a truly unforgettable experience as you sip mint tea on the beautiful patio. The atmosphere is charming and the location is convenient. The staff is also a wonderful source of information as you plan excursions and day trips. It's a true Moroccan experience to stay at this lovely riad in the heart of the city.